General Assembly President Sam Kutesa at the closing of the High-Level Thematic Debate on Means of Implementation for a Transformative Post-2015 Development Agenda. The creation of a coherent and synergistic strategy that marries the post-2015 development agenda, new methods of financing and efforts to reach a new climate change agreement is key if the international community intends to make strides on securing a sustainable future for all, President of the United Nations General Assembly, Sam Kutesa, declared today. Delivering the closing remarks to a High-Level Thematic Debate on Means of Implementation for a Transformative Post-2015 Development Agenda, Mr. Kutesa reiterated participants’ calls for “a fair, rules-based international trading regime” which, he said, would help fuel investments for development into the near-future. Mr. Kutesa had underscored the need for better financing in order to fully satisfy the breadth and scope of the new UN development agenda at the High-Level Debate’s opening on 9 February and, addressing delegates earlier today, he reiterated that “a huge financing gap for infrastructure” remained despite sufficient global liquidity. Nonetheless, he added, proposals had been made on how to channel the necessary funding in the most valuable manner and, in particular, from “all sources” – public and private, domestic and international. 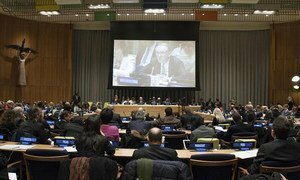 Moreover, the General Assembly President reminded participants about “the important development role of parliaments” in determining budgets and monitoring policy implementation. This year marks the wrap-up of the ground-breaking UN Millennium Development Goals (MDGs), which world leaders agreed on 15 years ago. There has been significant progress in meeting the targets. For example, global poverty has been halved well ahead of the 2015 deadline; in developing countries, 90 per cent of children now enjoy primary education; the number of people lacking access to improved drinking water has halved, and the fight against malaria and tuberculosis has shown results, according to the UN. But challenges persist, and with the deadline of the MDGs set for the end of this year, the UN will craft a new set of targets known as sustainable development goals (SDGs). The new agenda will aim to address a raft lingering and emerging challenges, such as the fact that globally, 73 million young people are looking for work and many more are trapped in exploitative jobs. The world has embarked on a “crucial last stretch” to the post-2015 development agenda and towards securing a sustainable future for all, United Nations Deputy-Secretary-General Jan Eliasson declared today, adding that the international community would finally have a chance to provide “a life of dignity” for millions of people.